Spend enough time searching for tips on how to optimize your Amazon business and you are sure to come across dozens of SEO and keyword tools out there. Some of them promise hacks that are guaranteed to get you to a top ranking, others say they ‘trick’ the search algorithm to feature your product first. Typically, I’m weary of black hat tricks and hacks that promise to outsmart the system. While some of the tools come in handy in certain scenarios, what I would recommend is to approach Amazon SEO from Amazon’s viewpoint. 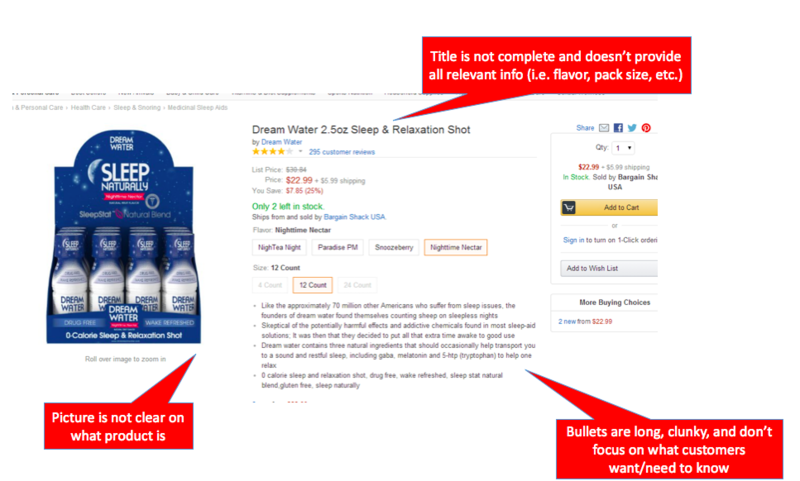 More than 80% of customers never scroll to Page 2 of a search, so how can you ensure that customers are happy and continue to purchase on Amazon? By providing relevant products that have a high possibility of converting into purchases. A simpler interpretation: show customers products they want to buy. This factors in what keywords customers are searching for, conversion rates, related products, recent sales history, pricing, stock, and much more. Thus, what keywords do you think customers are searching for when they are discovering your product? Have you included those terms in your keyword field when setting up your product (i.e. ‘backend’ keywords)? What products typically show up for your desired search terms, and how are they priced and how many reviews do they have relative to your product? How can you increase sales velocity in a short amount of time (i.e. Promotion) so that you move up the rankings? Also, keep in mind that going out of stock is like slamming the brakes on your momentum, especially if there aren’t any other resellers on your listing. Being out of stock will hurt you with rankings and search relevancy during that time period, and gives customers another reason to try a competitor’s product. One tip: If you do run out of stock on your FBA inventory, create a FBM offer to mitigate the potential lost traffic. I have seen hundreds of examples of brands that showed up on the first page of search or were even a Best Seller in their category, but after going out of stock for a few days lost that positioning and it sometimes takes weeks or months to regain that position. In those cases, a competitor’s listing increases visibility and unless you have extremely strong brand recognition, it is difficult to convince customers to switch back to your product after they bought/used another product. FBA storage fees in most cases are small enough that I would highly recommend having a 2-3 month buffer of inventory available at all times (or at least when possible). Since Amazon is a marketplace, you may very well be competing against other third parties to ‘win the buy box’. There are several repricing tools available on the market, and Amazon recently released the ‘Automate Pricing’ tool on Seller Central to help you automate pricing decisions. For example, you can set a rule to beat the buy box by 2% until you reach a certain floor. Ensuring you are winning the buy box regularly, and being alerted when you are losing the buy box, is essential to growing your Amazon business. Note that pricing for Vendors has a different process from Marketplace Sellers. Promotions are a great way to increase visibility and gain reviews. Lightning Deals, price discounts, best deals, coupons, buy one get one offers, discount codes etc., are all great opportunities to offer and highlight a temporary discount to your product. This benefits you by not only allowing you to sell more units in a short amount of time, but it also temporarily lifts your baseline business post promotion (i.e. you move from #50 best seller to #10 when your promotion ends, likely increasing your run-rate temporarily at your regular price). Another thing to keep in mind is that unlike in physical stores, having a ‘high-low’ pricing model often does not work well in the long-run for Amazon sellers. For example, at a big-box Retailer it is common to see the price of a product at a high price, say $50 for the first three weeks every month, and the price drops on promo to $25 the final week of the month. While there are some inherent benefits for stores to do this, this would probably hurt you on Amazon. The reasons why this is not recommended, and instead a stronger everyday price (‘EDLP’) is preferred, are simple. For one, this creates a huge range and arbitrage opportunity for other sellers to buy your product when you are on sale, and undercut your price to win the buy box when you are not on sale. Additionally, many online shoppers are savvy and utilize pricing tools to track pricing. If it is obvious that you lower the price dramatically once a month, customers will simply wait until your price drops. Finally, because the Best Seller Ranks and Search Algorithms are constantly updating, you may drop in search results when you are not on sale, and increase when you are back on sale. 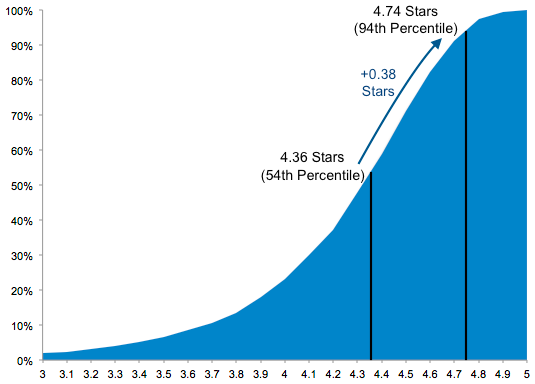 If this is the case, you are probably better off limiting the high-low model and moving to a stronger everyday price so that you can build momentum in your rankings over time and continue to gain more reviews. Does your title clearly describe to customers what the item is and if it is compatible with their needs? Does it mention the brand name? Does it clarify what the use case is or primary benefit? And most importantly, does it do all of this concisely so it isn’t too long to skim? For example, a succinct yet complete title such as below probably works better than simply “Maximus Outdoor Light” or even than a 3-4 line long title that looks more like spam than a product title. It was commonly believed that adding as many keywords as possible into a title would help with SEO, but if you look at most best sellers in popular categories, their titles are usually no more than 10-20 words. This is likely because customers have a hard time quickly scanning long titles, and they may even get annoyed with titles that are displayed this way (not to mention titles may get cut off while searching on mobile or on deals). Make sure to hit all of the key areas that customers need answered before they have to scroll below the fold on desktop or to additional sections on mobile. Mention key facts like if there is a warranty or customer service available to troubleshoot issues. Also avoid having bullet points that are more than a few lines long since most customers are skimming this section. Your main photo should clearly show what the product is before zooming in. Additional photos should provide additional angles of the product, and if relevant lifestyle imagery. It is also probably worthwhile having one image of the ‘back of the box’ showing ingredients and instructions. Also, ensure the images are high quality so the customer is able to zoom in and out. Remember that customers are skimming so a 20-line long paragraph probably won’t do the job. Use your brand voice here and reiterate key selling points while mentioning any supporting facts that can help customers understand why they need to buy now. Variations allow you to easily display to customers the various size, color, style, etc. options you have for your product. While each product will still have it’s own unique ASIN and detail page, variations present customers the ability to quickly switch between options of a product, and equally important pool reviews amongst those ASINs. For example, if you are selling an iPhone case in black, blue, and silver, a variation will allow customers to easily hover over the various color combinations, and the reviews for all of those options will be pooled together (i.e. the black gets 5 reviews, blue gets 3 reviews, and silver gets 2 reviews, the review count displayed for all options would be 10). 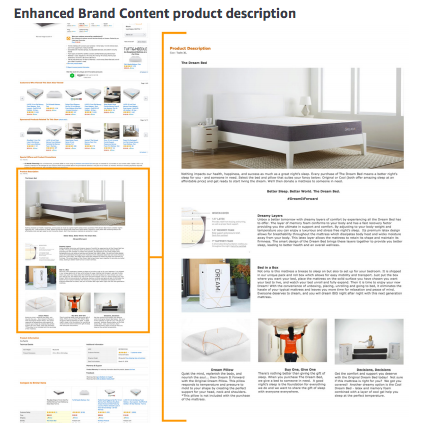 Now available for Brand Registered Sellers, EBC is a version of A+ content, which allows you more room on the page to add visuals and text to increase customer engagement and tell a better product and brand story. The potential benefits are increased conversion, lower return rates, and increased brand following. 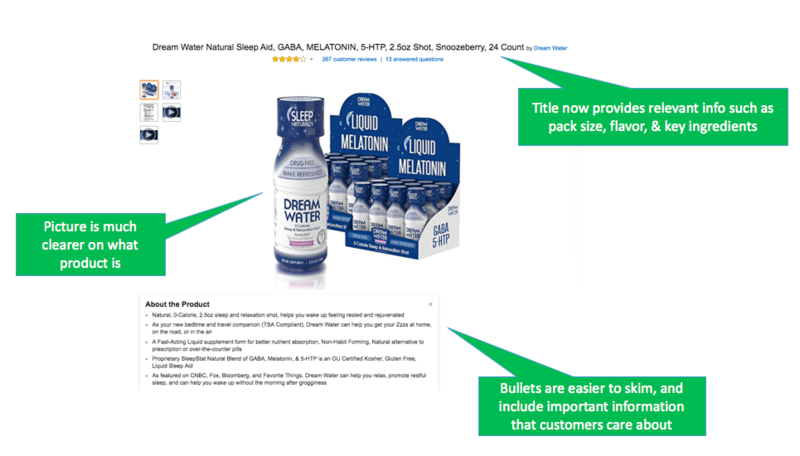 A+ content was originally only available to Vendors but the recent roll-out to brand registered sellers is a huge opportunity for sellers to better showcase their products on Amazon. It’s no secret that reviews are extremely important. We have likely all bought something on Amazon, and in many of those cases the decisions came down to which product had the better reviews, even if it had a higher price. Furthermore, as I mentioned at the beginning, reviews on Amazon will have an impact on other channels, including your Shopify site, since customers tend to do research on Amazon first. On that note, Amazon recently made a change to its review policy. 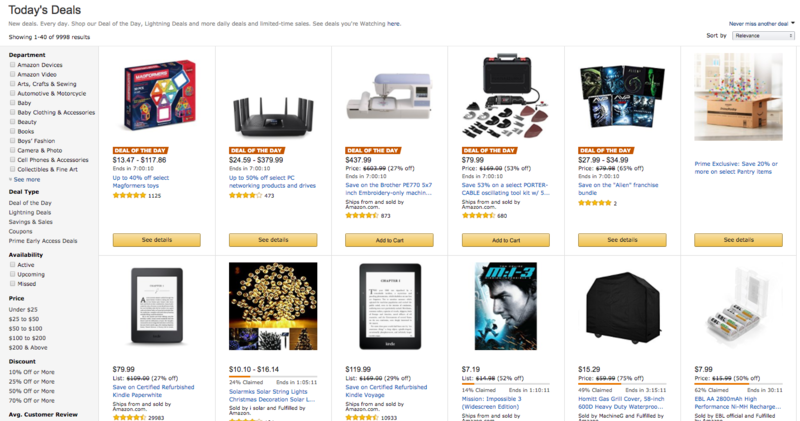 In short, Amazon is banning reviews for discounted or incentivized products. Previously, many brands would provide discounted or free products to customers through a variety of channels including review sites in exchange for a review. A recent study of over 7 million reviews showed that the average rating for incentivized reviews were meaningfully higher than non-incentivized reviews. So, what can you do to get reviews? Start with email follow-ups. You can, however, send a few emails confirming you have received an order, and also following up on an order requesting them to leave a review or seller feedback. There are tons of best practices out there, but I’d recommend sending no more than 2-3 emails: one during the order confirmation or delivery phase, and one a few weeks after the product was received. Avoid making your emails feel too ‘spammy’ or aggressive, and give customers an outlet to share negative feedback directly with you prior to writing a negative review. Another way to encourage reviews is through a product insert, following the same guidelines as the follow-up email (i.e. not incentivizing reviews, directing the customer off of Amazon, etc.). Bonus points if you have make your insert fun and memorable so customers want to leave positive feedback. Yet another way to get reviews is by asking previous customers (or ‘backers’ if you were crowdfunded) to leave you a review on Amazon. As long as you are not incentivizing people to leave a review (i.e. “I’ll give you a $5 credit” or “You’ll be entered into a sweepstakes”), this is a safe and legitimate way to garner reviews. Customers don’t have to actually buy the product on Amazon to leave a review (although those show as ‘verified purchases’), so a customer who has purchased your product elsewhere such as your Shopify store is eligible to leave a review for your product on Amazon as long as they have an account. Finally, Amazon does offer programs such as the Early Reviewer Program, and there are rumors that it has just started to roll out the Vine Program to select sellers, so both are potential opportunities to encourage reviews.